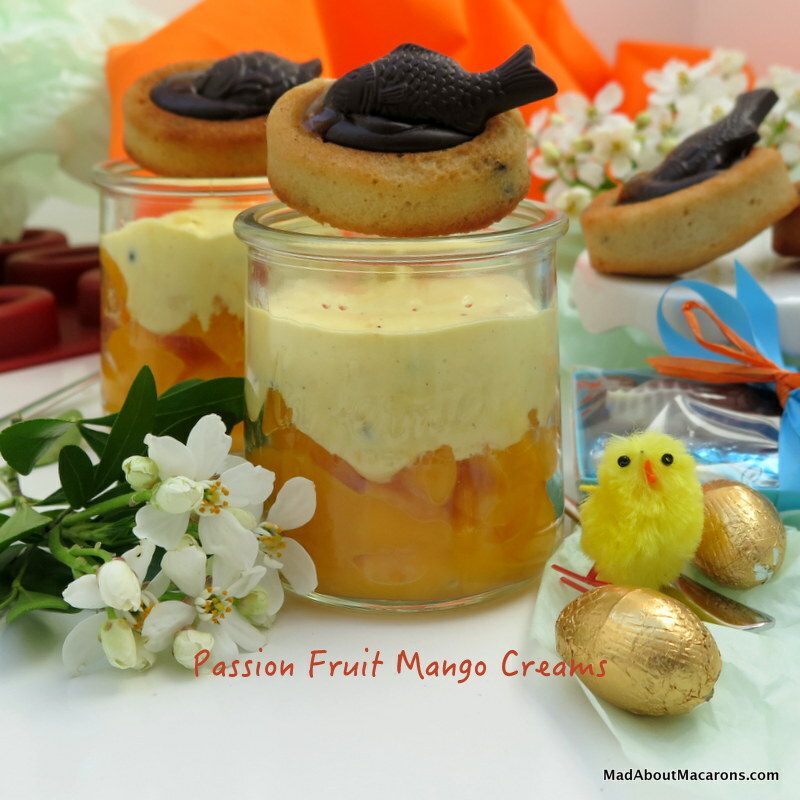 What better way to enjoy chocolate this Easter with a quick and easy no-bake dessert that accompanies it: Passion Fruit Mango Creams. 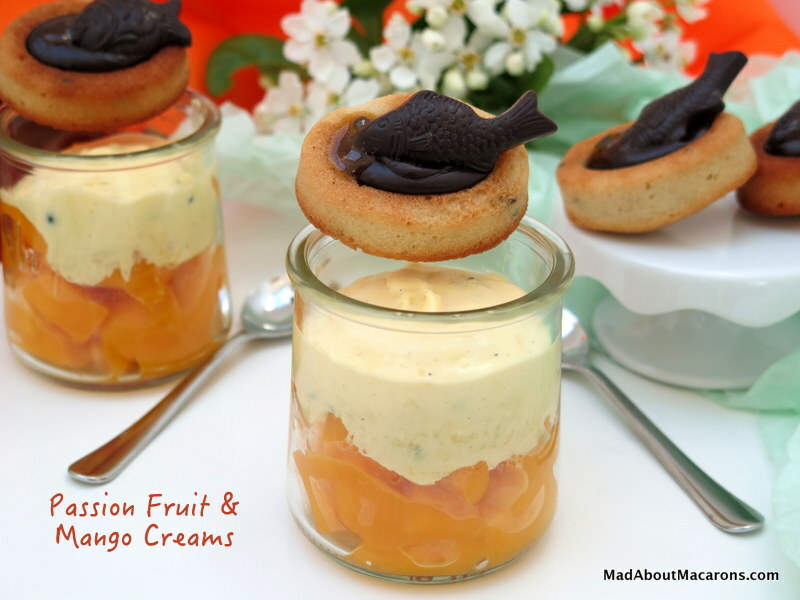 As I’d bought a bag of dark chocolate fritures (French chocolates in the shape of fish and seafood) for April Fool’s Day, I couldn’t help thinking of the gorgeous pairing of chocolate with passion fruit and mango. 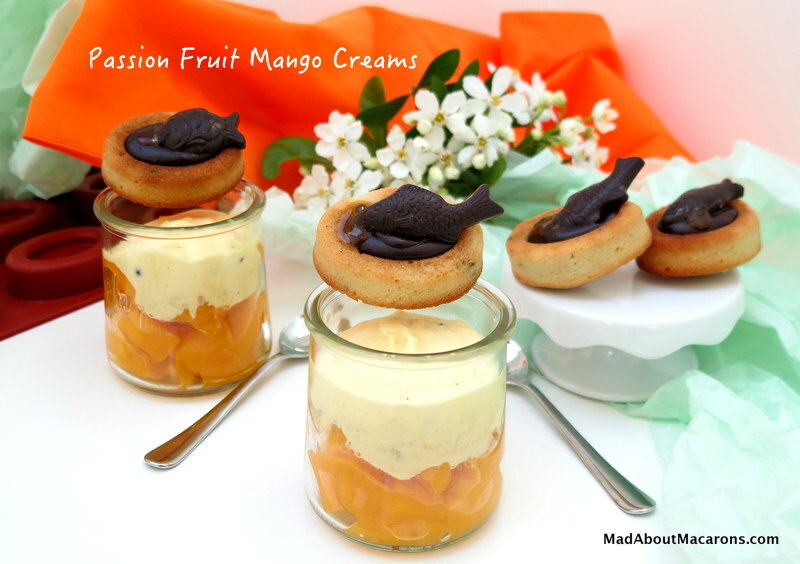 So, inspired by William Ledeuil, French chef at Paris’s Ze Kitchen Galerie who specialises in French food with Asian influences I set about whipping up this quick dessert. Chef Ledeuil would use a fresh vanilla pod and add citronnella but I’ve made a quicker version with powdered vanilla (or use vanilla extract) and fragrant limes to replace the citronnella. Chocolate fish are popular in all the chocolateries in France since April Fool’s Day is known as Poisson d’avril. If you’re any decently duped April Fool in France, you’ll probably be sporting a school of colourful paper fish taped to your back. The story behind the traditional fish remains unclear. Various sources cite the most popular: it goes back to the 16th Century under Charles IX reign, who changed the New Year to the 1st January. Until then in France, the New Year started around 1st April and was celebrated by fresh fish to herald the arrival of Spring (following the zodiac sign of Pisces, perhaps). Not everyone was au courant or kept forgetting this new calendar, so jokes gradually spread via the custom of pinning fish on their backs! 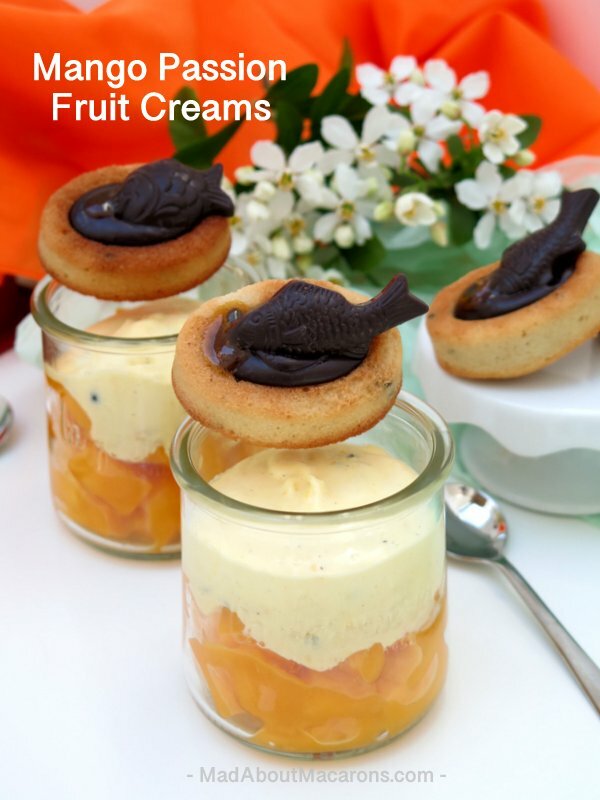 Fish continue to be seen throughout Easter but, fish or not, mini Easter eggs or just squares of good quality chocolate will go well with this zingy dessert. Here I added my favourite Tigrés (financier teacakes with chocolate chips baked in savarin moulds and topped/filled with chocolate ganache) from “Teatime in Paris” and added just a blob each of the passion fruit syrup before adding it to the cream. Cut the mango in two vertically next to the stone, cut off the skin and chop the fruit into small pieces. Place in a bowl. Zest the lime (about 2 strands of 2-3 cm) and set aside. Squeeze out the juice and add it to the mango. Refrigerate. Also refrigerate a large bowl for whipping the cream later. Place a sieve over a saucepan and press through the pulp of 2 of the passion fruits. Discard the seeds. Add the remaining passion fruit (seeds included), the sugar and the lime zest. Bring to a brief boil then simmer for 10 mins. Set aside to cool then refrigerate. Once cool, remove the zest. Whip the cream in the chilled bowl using an electric (hand or standing) whisk, adding the sugar. When thickened, add the cooled passion fruit mixture, and whip it into the cream. incorporate. 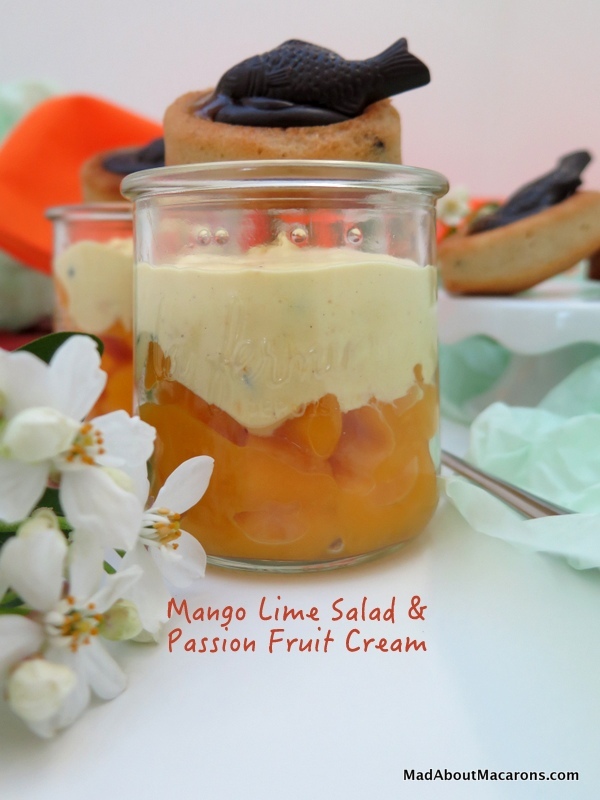 Spoon the mango lime salad into glasses then top with the passion fruit cream. Top with chocolate chip financiers (optional, recipe in Teatime in Paris, but honestly, this is so delicious together!) or simply a few dark or milk Easter chocolates – and, dare I say, chocolate macarons? Perfect for our Easter party Jill especially when it’s a no bake dessert. Thanks for the explanation of the chocolate fish. I’m going to decorate mine with tiny chocolate eggs. Looking forward to reading your Easter blog. So glad you’ll be making this, Thomasina! I’ve been so busy running around and have guests this weekend that I’m afraid I don’t have the time to put together an Easter blog post this year but I do hope you enjoy last year’s post here, which conjures up the same ambience. Saw these lovely creations on Facebook, Jill! What a delightful and playful dessert which is absolutely perfect for April Fool’s Day! You are so good about celebrating each holiday, or fun day with an appropriate sweet! Hopefully this is for any time of year, Christina – and even with the April fishes in the chocolate windows, they’re still continuing well into Easter. Thanks so much for popping in. When your post showed up in my email, I wondered if there would be an April Fools angle 🙂 This layered dessert looks awesome and chocolate fish are the perfect garnish for both April Fools and Easter!! You know, Liz? I never even thought about posting a spoof but next year, who knows? Thanks for popping by! Have a wonderful Easter.